To isolate the DP transmitter from the process for maintenance and calibration. , the equalizing valve is closed and the two block valves(HP and LP) are open. 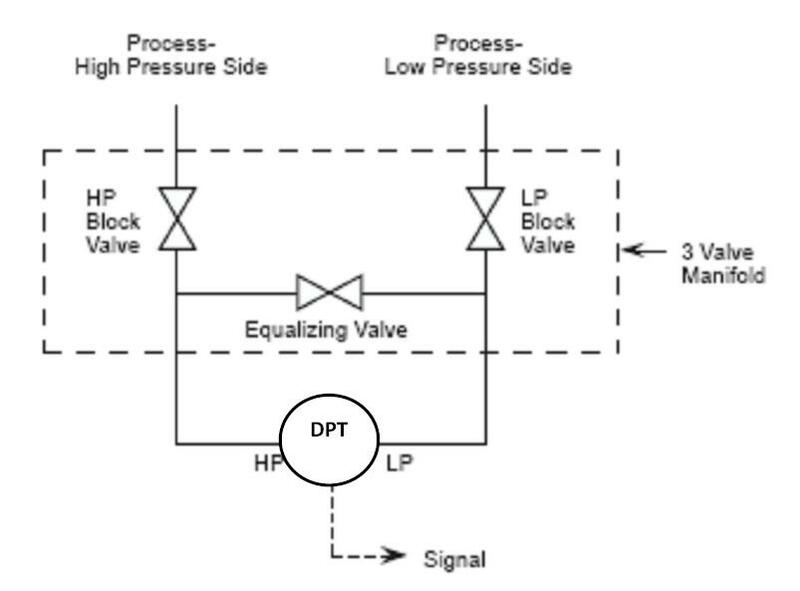 When the transmitter is put into or removed from service, the valves must be operated in such a manner that very high pressure is never applied to only one side of the DP transmitter capsule. Check all valves HP,LP and the equalizing valve are closed. Close the equalizing valve. This locks the pressure on both sides of the transmitter. The transmitter is now in service. After removing the transmitter from service, it may be necessary to bleed any trapped air from the DP transmitter capsule housing. Close the low-pressure block valve. Close the high-pressure block valve. The transmitter is now out of service. The transmitter capsule housing still contains process pressure; this will require bleeding. 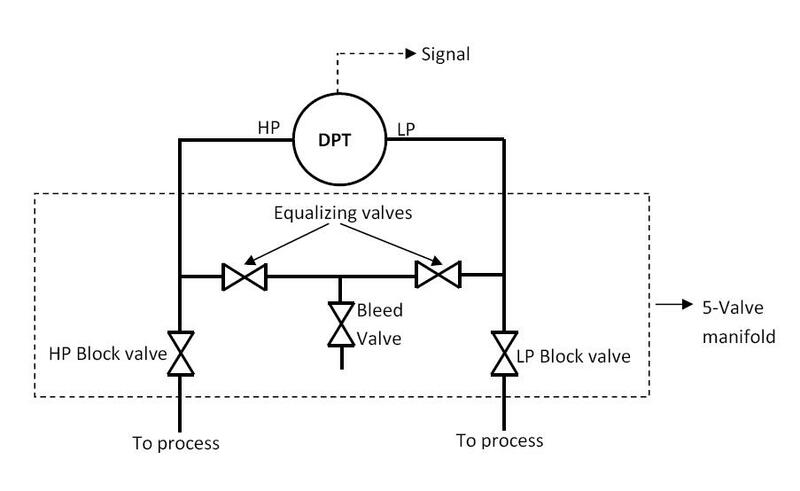 During normal operation, the HP and LP valves are open while the equalizing valves and the bleed valve are closed. However, It is critically important that the equalizing valve(s) never be open while both block valves are open! If the process fluid is dangerously hot or radioactive, a combination of open equalizing and block valves will let that dangerous fluid reach the transmitter and manifold, possibly causing damage or creating a personal hazard. Transmitter valve manifolds also come in single block-and-bleed configurations. In this scenario, the transmitter is being used for gauge pressure applications. Here, the “low” pressure port of the transmitter is vented to atmosphere, with only the “high” pressure port connected to the process medium through impulse lines. 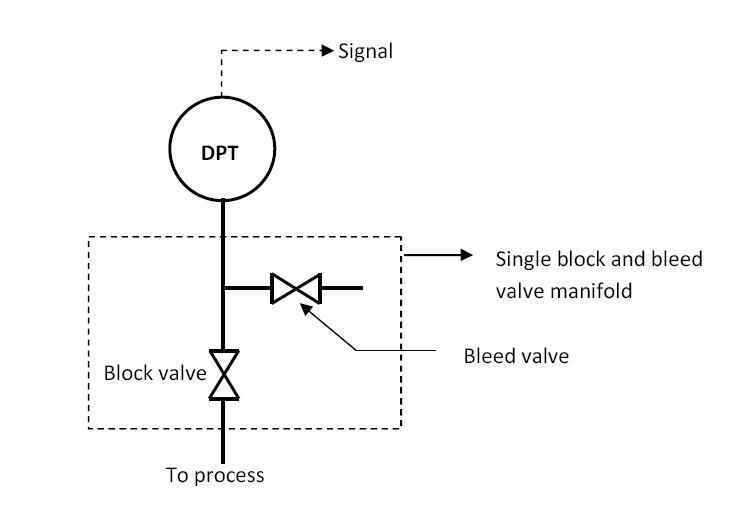 The schematic diagram below shows the single block and bleed valve manifold. Removing the DP transmitter (DPT in diagram above) is very easy. Simply close the block valve and open the bleed valve to vent process pressure to the atmosphere. The DP transmitter is already out of service. Putting the transmitter back into operation is also easy. Ensure that both bleed and block valves are initially closed. Then open the block valve and the transmitter is back to service.